May not be available. Please call (206) 366-3333 for info. 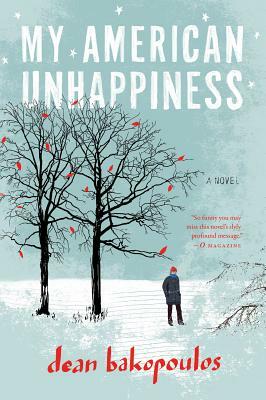 Yes, this is actually a laugh-out loud book about unhappiness. Zeke's funding for his Inventory of American Unhappiness Project is running out. In the meantime, while gauging the unhappiness of everyone around him, he ignores his own well-being. Zeke is a likeable narrator that just needs a good waking up to discover the riches that surround him. This is a warm-hearted book that will cheer you up, even as it inventories the unhappiness of America. Dean Bakopoulos is the author of the novel Please Don’t Come Back from the Moon, a New York Times Notable Book, and the recipient of fellowships from the National Endowment for the Arts and the Guggenheim Foundation. He is on the faculty at Iowa State University and the Warren Wilson MFA Program for Writers. My American Unhappiness "shimmers with mischief and offbeat charm. A dark entertainment infused by a bluesy yearning for a better America." "Bakopoulos writes with great heart and a cold eye, and his limpid, ironic prose will appeal to those who like the early work of Martin Amis." "My American Unhappiness is a smart, funny, charming novel - an incisive critique of the way we live now, but aremed, unlike contemporary satire, with a big, generous heart. I got addicted to the misadventures of Zeke Pappas. I didn't want the book to end." "In Zeke Pappas, Dean Bakopoulos has invented a man for all rainy seasons - a horny, heartbroken cousin of Richard Ford's Frank Bascombe, telling a long, tall tale of anomie in the heartland." "If the nature of despair, as Kierkegaard wrote, is to be unaware of itself, then Zeke Pappas is its perfect spokesman: a blithely deluded nebbish whose epic longings—to document the emptiness at the center of American life and to win the heart of Sofia Coppola and/or his local Starbucks barista—propel him into ever more twisted predicaments. There's no such thing as unhappiness when you're holding a Dean Bakopoulos novel in your hands." "Vivid as a searchlight gliding across suburban picture windows , MY AMERICAN UNHAPPINESS displays its author's saddened comic wisdom, as apparently self-effacing as it is marvelously inventive and observant. Dean Bakopoulos is a writer to watch, a novelist to cherish." "Zeke Pappas, the visionary behind the American Unhappiness project, is the perfect hero for our times - an age of J. Crew catalogs and Starbucks lattes, of political absurdities and almost-fractured families barely holding themselves together. In telling Zeke's story, Dean Bakopoulos brings together razor-sharp comic timing, brilliant social commentary, and big-hearted compassion that embraces the imperfection of American life. The result is a smart, funny and exceptionally entertaining book." "My American Unhappiness is a major accomplishment from one of my generation's finest storytellers, a profoundly funny, moving, beautifully-detailed, and ultimately hopeful portrait of our country in a certain moment. Its self-deprecating hero, Zack Pappas, earnest, kind, and brooding, with wry intelligence and deep compassion, is indelible. I loved every page of this book. The torch has been passed -- Dean Bakopoulos is our next great Midwestern writer." "Dean Bakopoulos in an American prophet — who divines the end of optimism in this brilliant new novel that will choke you with tears and laughter. My American Unhappiness deserves a hallowed place on the shelf somewhere among Studs Terkel's Working and Walker Percy's The Moviegoer. "